Is matched betting legal? Read our definitive guide on the legality of matched betting and find out if you should get started today. Plus we share our most common frequently asked legality questions. Since you’re here you probably know a little bit about matched betting, but for those of you who are new to the concept, welcome! Matched betting is certainly one of the best ways to make money online. This betting method is both risk and tax free and you’ll be able to make up to £1000 every month. But, is matched betting legal? Yes, matched betting is 100% legal. We’re always told that when something seems too good to be true, it probably is. That’s even more the case when you’re talking about making money online. There is so much BS on the Internet regarding this industry. You’ve probably come across the so called ‘gurus’ claiming they can make you a millionaire overnight when in reality it’s all complete rubbish. Just to clear things up, matched betting is not one of these get rich quick schemes and you’re NOT going to become rich using this technique. When I got started with matched betting a number of years ago, I felt exactly the same as many of you may do. I wasn’t sure if matched betting was a legitimate way to make money. Matched betting is a no risk betting technique that takes advantage of the massive range of bookmakers free bets and promotions. Well, it’s these promotions and offers that matched bettors take advantage of. So next time you see a betting advert at half time or when you’re out and about think… I can make money from that. The betting industry is one of the toughest and most competitive markets out there. Period. This is beneficial for us matched bettors. More competition means there are more betting companies potential customers can sign up to. Therefore, each bookie needs to do more to gain new customers and entice existing customers to stay loyal to them. Coral offer new customers a £20 free bet if they sign up and stake £5. Similar to the offer above, each bookie promote a huge range of bonuses on a daily basis. Despite a great deal of change in the betting industry, there are still plenty of free bets and other promotions available in 2018. If we multiply the number of offers by the number of bookies that exist online, there’s a huge number of promotions to make money from. Matched bettors aim to extract roughly 80% of a free bet in cash, all of which is completely tax free. There are two types of offer that you can take advantage of using matched betting. These are sign up offers and reload offers. Sign up offers are for new customers only and almost every online bookie runs one of these promotions to gain new customers. Reload offers are the ongoing promotions the bookies offer to entice existing customers to keep betting. These offers are where the long term profit is made with matched betting. You’ll generally find reload offers available for football and horse racing events. We list all the latest offers here at The Sure Bettor, so be sure to stay tuned if you’re looking for promotions to take advantage of. It’s not just us folk here at The Sure Bettor who are so keen on matched betting. We won’t go into too much detail about how matched betting works, as we do this in other articles. However, in basic terms, we use a concept called back and lay betting which takes out any chance involved with normal gambling. That’s why there’s no risk involved with matched betting. As with most things, an example goes a long way to help explain. Let’s say Bookmaker A are offering a £20 free bet if you sign up and stake £10. However, you don’t need to get bogged down in the nitty gritty just yet. That’s where The Sure Bettor comes in. We walk you through the whole process, from start to finish. Is matched betting actually legal? As we said at the start of this article matched betting is 100% legal. All we’re doing is taking advantage of the bookies free bets and promotions. There’s nothing illegal with what we’re doing. If you were a normal gambler looking to maximise the profit from your betting you’d look for similar offers to the ones we take advantage of using matched betting. That’s why the bookies promote them. The only difference is that matched bettors use a method that guarantees a profit no matter what the outcome of the event. We do this by placing two bets at different betting companies – a completely legitimate practice. Not convinced that matched betting is legal? Here’s what Graham Sharpe from William Hill said about matched betting. There you have it. One of the UK’s top betting companies confirming there’s nothing illegal with matched betting. So we know match betting is legal, but what about gnoming? We’re often asked about gnoming and specifically is gnoming illegal? To get straight to the point, yes, gnoming is definitely illegal. There’s probably some of you reading this, wondering what on earth gnoming is. So, who better to ask than the Urban Dictionary. Gnoming in betting is when a punter opens multiple accounts with one bookmaker. It’s also known as multi-accounting and it’s a strategy I thoroughly recommend you don’t use. Punters and matched bettors use this method to maximise their income from a single bookmaker. They sign up to a bookie using a family member or friends name in order to access the free bet or bonus multiple times. On the face of it, this looks like an awesome method to maximise your earnings. However, I strongly encourage you not to use this technique as it is 100% illegal. Claiming to be someone you’re not is fraud. There are matched bettors that use this method to great effect. However, do so at your own risk. If the bookies catch you, you’ll be in hot water and any winnings you have may be taken away. Along with closing your account, the bookie may even file a lawsuit against you. So, now that we’ve worked out the answer to is matched betting legal and we know that gnoming is 100% illegal, let’s find out what the bookies think about matched betting. After reading that William Hill statement above, you’d think the betting industry doesn’t have a problem with matched betting or arbing. However, that’s not 100% accurate for reasons we’ll look at below. Most betting companies aren’t huge fans of matched betting but they’re also not outraged at it, if that makes any sense. They’re sitting somewhere on the fence. Over time, the bookies may become frustrated with punters who are abusing their bonuses and taking too much value. This frustration is not specifically aimed at matched bettors but rather the whole betting community. Think of it from the bookies point of view. They’re offering free money which people are taking advantage of. If a new customer signs up using these promotions, the company is happy. Their marketing team have done a good job. However, as time goes on and a punter/matched bettor starts abusing the promotions (takes advantage of every single offer without placing any ‘normal’ bets), the bookie will become annoyed. Unfortunately too many matched bettors only place bets when there is a bonus or promotion available. This is a strategy that will lead to account restrictions or bans. On the flip side, one of the big arguments for matched betting is that we bring new customers to the betting company in the first place. Matched betting is not gambling so we’re introducing customers who wouldn’t necessarily sign up to a betting company. However, the bookies may argue that they don’t want customers who aren’t real punters. Overall, the main theme is that the bookies don’t want customers continually taking advantage of their promotions. In fact they will restrict or gub accounts that they perceive are not playing fairly. Gubbing is an industry term to describe the process of a bookie restricting or closing your account. To maximise your profit with matched betting, you need as many bookmaker accounts open as possible. Any restricted accounts or worse are usually rendered useless in terms of matched betting. Unfortunately it’s a common theme in betting and by extension matched betting to see accounts being closed. It seems the bookies are taking ever quicker decisions to close down accounts that are taking too much value. More experienced matched bettors will know too well the dreaded email you receive when the account admin team have made their final decision. Can the bookies identify matched bettors? In the short term it’s tricky to differentiate between normal gamblers and matched bettors. However, over a longer period of time the bookies work out who the matched bettors are! Many bookies, especially the larger firms like Ladbrokes and Coral, have very sophisticated technology that paints a clear picture of account activity. It’s believed the bookies use the same technology to profile accounts as they do to catch fraudsters. It’s also thought that there are a number of ex matched bettors who have turned rogue! Matched betting is a very profitable technique and it’s still well worth doing. So how can you stop the bookies from noticing? The main aim is to make yourself look like a normal gambler. I recommend you don’t continually take advantage of free bets without giving some value back to the bookie. Read our in depth article about ways of staying under the bookies radar here. Right, now it’s time for some frequently asked matched betting legality questions. I’m 17, is matched betting legal for me? No, you have to be at least 18 years old for matched betting to be legal – just like you do with any betting in the UK. I live outside the UK, is it sill legal for me to open accounts with English bookmakers? If you have a registered address in the UK (with proof of ownership) it’s still legal for you to open an account with UK bookmakers. For more information visit our matched betting abroad article. Is matched betting legal if I use a VPN? Many matched bettors get away with using a VPN, however, it can be risky business and the bookies are certainly within their own rights to close down your account if they find out. Is The Sure Bettor a scam? No, The Sure Bettor is not a scam. Lots of people are skeptical about the legitimacy of our site. This is probably because betting is involved and making a guaranteed profit in gambling is not common. However, we are 100% a legitimate company helping people make money online. Try our free trial and find out for yourself. Is matched betting a get-rich-quick scheme? As I mentioned earlier in the article, no, matched betting is not a get-rich-quick scheme. Unfortunately, there is no such thing. Generally speaking, the more you invest in something, the more you make from it. However, matched betting is THE most profitable, legitimate way to make a lot of money in a short space of time. Is matched betting legal and should you get started? So, overall is matched betting legal? You bet… As we’ve said above, matched betting is 100% legal. The bookies aren’t so keen on those who continually take advantage of their free bets but by using methods to blend in with the crowd and hide your matched bets you shouldn’t have any problems. 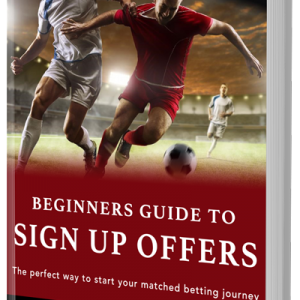 Now is a great time to get started with matched betting. There are plenty of offers available and here at The Sure Bettor we provide all the help you could need. If you’re still wondering is matched betting legal or you have any other questions, get in touch with us and we’ll be more than happy to help. You never know, your question may end up in this article.